Medical School: Rush Medical College, Chicago, Ill.
Frederic E. Levy, MD, is a native of Chicago, Illinois, and a graduate of the University of Illinois in Champaign where he majored in biology. He earned his medical degree from Rush Medical College in Chicago. Having grown up in Chicago, Dr. Levy is a huge fan of Chicago sports teams and plays most team sports. He participated in track and field in high school and currently runs between 40 and 70 miles each week. 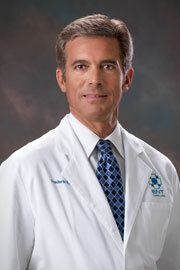 Along with other physician friends, he runs ten races, including five marathons, per year. He's run in six Boston Marathons and has run marathons in five countries. Music is also a part of Dr. Levy's life. He plays bass guitar and has been a member of various bands since he was fifteen years old. His most recent band is a classic rock band named "Sonic Tonsil". Dr. Levy is the proud father of a college-age son who plays guitar and writes music and a daughter who runs cross county for her high school team.